Caption: An eye-tracking heat map shows where consumers look first, and for how long. The red spots indicate that consumers spent the most time viewing that area. The National Pork Board has conducted eye-tracking research to determine exactly what consumers look at while shopping the meat case and for how long. The research also identified which images and messages resonate best with shoppers, and inspire them to pick up meat for their shopping carts and the center of their plates. The results show that images of whole cuts of pork proved to attract consumers’ attention more swiftly, and more effectively communicate the meat type (pork), than dishes that use pork only as an ingredient. Consumers also prefer signs that don’t include photographs of people, as it distracts them from focusing on the meat image. Based on the short amount of attention time that ironman signs get in grocery stores (about three seconds), the meat image may never be looked at when people are included in the photograph. Additionally, clear call-to-action taglines fared better than brand taglines in terms of participant preference. More information on the eye-tracking research can be found at PorkRetail.org. 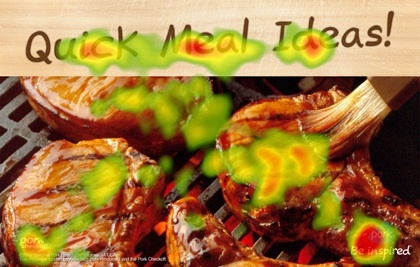 In March 2013, GfK User Centric conducted an eye-tracking study of pork ironman signs to be used in grocery stores. Fifty-eight participants (33 females and 25 males) who consume fresh pork several times a month took part in 30-minute one-on-one sessions. Participants were shown several pork ironman signs interspersed with an equal number of signs advertising non-meat products. Participants’ eye movements were recorded to shed light on how the information on the signs was visually consumed. A few interview questions were administered at the end of the session to obtain preference data on the ironman signs.